We just had a small hosting accident yesterday. Richard’s visitors had pumped 80 GB out already this month on his FreeTheAnimal weblog primal living weblog. Not bad for a single writer not in a formal network. Every month his traffic is growing. Congratulations Richard! These 80 GB of bandwidth are the real thing, with just a few slightly overweight images, not a single big file accidentally uploaded. Richard was surprised and upset to see his weblog cut off as were we. While most hosts cut clients off as a routine matter of business, we do not. We treat our clients as we would like to be treated ourselves. Clearly this is a clear violation of our hosting and customer service commitment. We recently moved from the dreadful hSphere control panel to the comparative friendliness of cPanel. 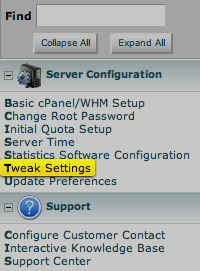 We knew how to fix this issue in hSphere but had missed adding it in our default cPanel server setup. Here's how you make cPanel behave much more courteously with your customers. While you are at it, you may as well hit up your users with email warnings at 80 and 90 and 95% bandwidth so they can ask for an upgrade or at least are ready for their upgrade when it comes. Unfortunately, these notifications only go to the client and not to you. To go without bandwidth overage cutoff this, we need to know when clients are exceeding bandwidth so we can upgrade them. There doesn’t seem to be any simple notification system for admins. A workaround would be to create an account notification email for each client on your own hosting email account which is forwarded to them and then to you. Advantage is that you’d see what snarky emails your automated server software is sending out on your behalf to alienate clients. Still that’s lots of extra work when setting up an account and another moving part to break. 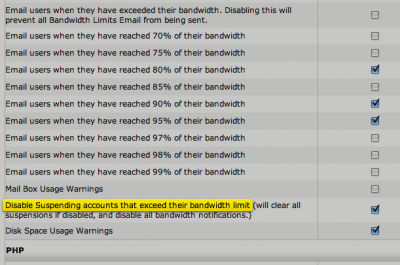 But there is a screen available in WHM: Account Information: View Bandwidth Usage. This gives you this very helpful chart to see who is in the yellow and red zone. I’ve already adjusted everyone’s plans to get them back into the white so sadly there’s no yellow or red on this chart. If anyone knows how to get automated notices sent to server admin as well, please share the wealth. Your article was very descriptive and helpful. 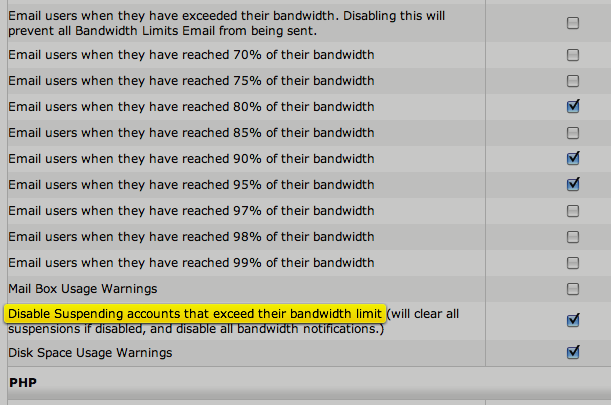 But I don’t think the option to suspend account after exceeding bandwidth is available in latest WHM version.